The Ansell TouchNTuff 92-605 Chemical-Resistant Disposable Nitrile Gloves are manufactured using a unique thin nitrile technology for reliable, splash-proof protection against chemicals and micro-organisms, with easy donning and outstanding grip in both wet and dry conditions. Thanks to this nitrile formulation, the 92-605 gloves provide up to four times the puncture resistance of similar latex gloves, and three times the resistance of comparable neoprene gloves. The TouchNTuff 92-605 Disposable Gloves have been tested in accordance with EU standard EN 374 - 1, and EN 374-5, and are certified for protection against virus and contact with a number of chemicals (Type B). 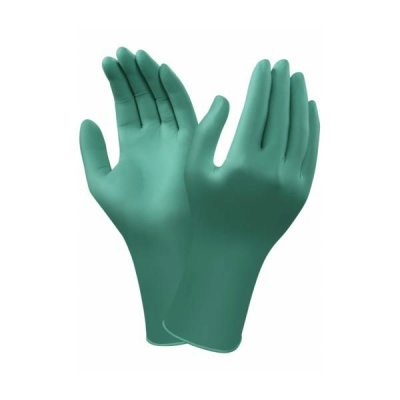 The TouchNTuff 92-605 Nitrile Gloves are available in a range of sizes. Please measure the circumference of your hand around the knuckles (excluding the thumb) with your hand open and your fingers together, and the length of your hand from the tip of your middle finger to your wrist.